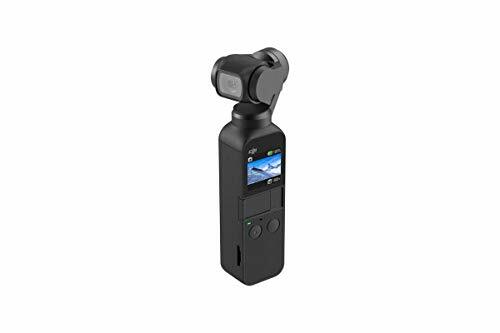 The DJI Osmo Pocket is a very capable and versatile tool for shooting stabilised video and photos when on the go. Its tiny size and awesome three-axis gimbal make it so convenient to capture smooth footage, while its battery lasts a good amount of time between charges. DJI is one of the most innovative companies in the world when it comes to cameras and drones. From its drones' almost magical object tracking and obstacle avoidance, to the ever-so-handy Osmo handheld gimbals for capturing super-smooth stabilised video. Having already upgraded the popular Osmo Mobile (which uses your phone's camera) in 2018, the latter part of the year saw the introduction of a new Osmo with a built-in camera: the Osmo Pocket. Is it the ultimate portable camera-and-gimbal package? One of DJI's biggest developments over the past few years, on the drone side, has been its mechanical gimbal system – which stabilises cameras for smooth capture. DJI has been slowly making this system smaller and smaller, to fit products like the Mavic Air. Indeed, the camera fitted to the top of the Osmo Pocket looks like something you'd find on the front of one of DJI's smaller drones, as does the sturdy mechanical gimbal that holds it in place. This component then attaches to the main body of the Osmo Pocket. Size wise, from top to bottom, the Pocket is much shorter than a typical smartphone. It's a good centimetre or so shorter than the Google Pixel 3, for example, which in itself isn't the biggest of devices. It's also less than half the width, making it incredibly portable, and deserving of its "Pocket" name. We could comfortably fit it in a jeans pocket alongside a smartphone without any trouble at all. The entire handle, or case, is built from plastic with a texturised, almost sand-like finish that makes it grippy and easy to hold, while also ensuring that it's light and portable. On the front you'll find everything you need to control the camera system. There's a small LCD touchscreen on the top, beneath which is a slide-off plastic tab that hides the four connector points for using modular slide-on accessories. You can connect a physical scroll wheel accessory (and optional extra), which is great for controlling the camera's pan and title functions, or connect your smartphone and use the phone's much bigger touchscreen as both control and monitor. The only real downside to these modular clip-ons is the size of them. The small cover that slides over the contact points to protect them is no larger than a fingernail, and we anticipate many of these will get lost. As will the Type-C and Lightning connectors you can use to connect your smartphone. In our relatively short time with it, we managed not to misplace them, but given a longer testing period we're almost certain one short lapse in judgement would ensure we would. There are other accessories forthcoming too. There's waterproof housing on the way, along with mounts for attaching to helmets and backpacks, or even your wrist. There's going to be a wireless module for connecting the Pocket to your smartphone via Bluetooth/Wi-Fi, a set of ND filters (neutral density – used to limit incoming light) and a really cool-looking charging case that can keep it topped up on the go. As well as having some of the best mechanical gimbals and drone hardware in its portfolio, part of what has made DJI such a success is its advancements in auto-tracking features and various shooting modes, all controlled by algorithms. With the Osmo Pocket, some of those (along with some newer ones) have been put into the company's smallest device so far. With face-tracking, the camera can automatically lock onto a person's face – without any input from the user – and automatically adjusts and moves the camera to keep the face in frame. Providing there's good light and the in-frame subject and the camera don't move too quickly then it'll work consistently. Combined with the automatic mechanical gimbal, that means you not only get smooth video, but the subject also never leaves the shot. But it's not as flawless in lower light situations – sometimes this will result in the feature struggling to find a face, or accidentally picking up the creases in a t-shirt instead. Similarly, the ActiveTrack used on most of DJI's other products is present in the Pocket too, and lets you select the subject/object on screen to automatically keep them in frame, even as you move the Osmo around. You can activate this by double-tapping the subject on the little 1-inch touchscreen, or you can connect a smartphone and use the DJI app, drawing a square with your finger around whatever you want it to track. Again, the amount of light you have to work with definitely impacts the success of the tracking feature, as does the speed of its movement and any camera movement. In daylight, it's great – even to the point of successfully tracking and panning to follow cars on a high street in New York. However, testing it inside Grand Central Station pushed it passed its limits – trying to track one person among a sea of fast-moving commuters was almost impossible. Get somebody away from others though, and it works great, providing other obstacles don't get in the way. In addition to these, there's FPV mode that – instead of keeping locked on a single horizon – follows your moves smoothly, giving a new edge to mobile camera movement. There are several ways to control the DJI Osmo Pocket, all of which are simple to master. A long-press of the right button switches it on. To capture a photo or start recording, simply press the left button (with the red dot on it). A double-tap of the right button re-centres and a triple-tap flips the camera around to 180-degrees to face the other direction. For choosing which mode you want to shoot in, simply swipe left on the touchscreen and then scroll up and down to select from the list of options. For settings, a further swipe left will access relative to the mode – for video, for example, this lets you select the resolution and frame-rate. Back in the main viewfinder screen, you can swipe down from the top to reveal a simple settings menu, or swipe right to get to the gallery of previous images and video. You can even swipe up and down on a little slide-bar on the side of the screen to tilt the camera up or down. To actually shoot video, and get smooth footage, all you need to do is point the Pocket in the direction you want and start recording, then move the camera in the direction you want it to go and the mechanical gimbal ensures it's as smooth as possible. Whether you want it to lock on a single horizon, or follow your movements for a more natural, momentum-based effect, you can get some awesome results. Using the Android or iOS app is just as easy, but definitely better for framing your videos well. Having a larger, more versatile touchscreen makes using it even better. You can control exactly where the camera points by simply dragging an onscreen virtual joystick. There is a downside to using the app though: for whatever reason, when the phone is plugged into the Osmo Pocket, it also uses it as a battery pack and helps itself to some of the Osmo's battery juice, draining the DJI camera's battery much faster – and we wish this feature could be switched off. With a camera this small you'd assume there was a compromise somewhere in video resolution and frame-rate, but this little video camera packs a serious punch and can record 4K video at up to 60 frames per second. You can record the following frame-rates in both 1080p and 4K resolutions: 24, 25, 30, 48, 50, 60fps. In addition, if you'd like fine-tuned control over exposure, white balance and other elements, there's a Pro mode available. You can record in widescreen or square modes, while shooting with the camera tilted sideways enables vertical video (if you're into your Instagram Stories that could be useful). What's more, it can even auto-rotate footage in a so-called "Underslung" mode, allowing you to hold the camera low to the ground – useful for shooting skateboarding footage or the like. Low-light performance is generally good in video modes, despite the capture performance not always being perfect. Image noise does creep in when there's not much light, and you really don't want to be shooting at 120fps when you don't have bright daylight to play with. In slow-motion, with little light, you get dark footage with not enough detail. In daylight though, the Osmo Pocket really shines. Because it's stabilised, the slow-motion footage comes out really smooth, even when shooting while walking. Similarly, stabilised regular footage is far smoother than what you'd get from smartphones with OIS-equipped lenses. If you care about stabilised, smooth footage, the Osmo Pocket is a no-brainer. As for photos, the 12-megapixel stills camera delivers well balanced and sharp shots, but could do with some more advanced HDR (high dynamic range) skills, as bright skies behind tall buildings caused some issues. There's an auto-stitched panorama option that can take a series of four horizontal photos, or a 3x3 grid, depending on whether you want that traditional long panorama, or a more immersive near-360-degree view. These can be a lot of fun, but can result in some inconsistencies – because the 3x3 panorama shoots nine photos in sequence, if there are any moving objects partway in a frame then you can end up cutting them in half. In addition, the 3x3 panorama would start its capturing process too low, leaving you with a really wide angle square photo with a little too much foreground. On the battery life front DJI claims up to 140 minutes of capture, shooting at 4K/30fps, which is a little optimistic for real-world usage. While we didn't test a constant two-hour capture to see if this claim was exactly true, we did find that we never once had to worry about battery life. The Osmo lasts a lot longer than a GoPro Hero, for example. Going out in Times Square, then walking up and around through Grand Central, the Rockefeller and Empire State building, we tested all the shooting modes, capturing slow-mo, stills, panoramas, and time-lapses over the course of a few hours and didn't manage to completely drain the battery. This definitely comes as some comfort, since the DJI Osmo Pocket's battery isn't removable. That means you can't just switch it out for a fully charged one when you're out and about. It's not quite perfect though. We'd love to see an optical zoom, better low-light performance, and a bigger display on the back, plus a more sturdy/less finicky connector system for connecting accessories. Perhaps an answer could be a 'Pocket XL' alternative – a product that's slightly larger, with a bigger camera lens/sensor and larger touchscreen, giving customers the choice. That said, adding your smartphone to the Pocket upscales the interface scale considerably – the only downside being that the phone pulls charge from the Osmo's battery. Overall, the experience of using the Osmo Pocket is fantastic, while the results it delivers – especially considering the size of the thing – are quite simply astonishing. There's nothing else like it on the market either, which makes it doubly impressive.